An unmanned combat aerial vehicle (UCAV), also known as a combat drone or simply a drone, is an unmanned aerial vehicle (UAV) that usually carries aircraft ordnance such as missiles and is used for drone strikes. These drones are usually under real-time human control, with varying levels of autonomy. Aircraft of this type have no onboard human pilot. As the operator runs the vehicle from a remote terminal, equipment necessary for a human pilot are not needed, resulting in a lower weight and a smaller size than a manned aircraft. China, and Israel and the United States are widely recognized as industry leaders in UCAV technology. Several other countries have operational domestic UCAVs and many more have imported armed drones or have development programs under way. France – General Atomics MQ-9 Reaper "F"
In the late 1980s, Iran deployed a drone armed with six RPG-7 rounds in the Iran–Iraq War. In recent years, the U.S. has increased its use of drone strikes against targets in foreign countries and elsewhere as part of the War on Terror. In January 2014, it was estimated that 2,400 people have died from U.S. drone strikes in five years. In June 2015 the total death toll of U.S. drone strikes was estimated to exceed 6,000. Sunrise over the Gulf of Saros area in Turkey, as seen from Bayraktar's tail camera at 18,000 feet. Israeli IAI Harop at Paris Air Show 2013. Instead of separate warheads, the drone itself is the main munition. Taranis is a British demonstrator program for unmanned combat air vehicle (UCAV) technology. It is part of the UK's Strategic Unmanned Air Vehicle (Experimental) programme (SUAV[E]). BAE describes Taranis's role in this context as following: "This £124m four year programme is part of the UK Government's Strategic Unmanned Air Vehicle Experiment (SUAVE) and will result in a UCAV demonstrator with fully integrated autonomous systems and low observable features." The Taranis demonstrator will have an MTOW (Maximum Takeoff Weight) of about 8000 kilograms and be of comparable size to the BAE Hawk – making it one of the world's largest UAVs. It will be stealthy, fast, and able to deploy a range of munitions over a number of targets, as well as being capable of defending itself against manned and other unmanned enemy aircraft. The first steel was cut in September 2007 and ground testing started in early 2009. The first flight of the Taranis took place in August 2013 in Woomera, Australia. The demonstrator will have two internal weapons bays. With the inclusion of "full autonomy" the intention is thus for this platform to be able to "think for itself" for a large part of the mission. In a New Year 2011 editorial titled "China's Naval Ambitions", The New York Times reported that "[t]he Pentagon must accelerate efforts to make American naval forces in Asia less vulnerable to Chinese missile threats by giving them the means to project their deterrent power from further offshore. Cutting back purchases of the Navy's DDG-1000 destroyer (with its deficient missile defense system) was a first step. A bigger one would be to reduce the Navy's reliance on short-range manned strike aircraft like the F-18 and the F-35, in favor of the carrier-launched N-UCAS ...."
The picture is further complicated if the UAV can initiate an attack autonomously, without direct human involvement. Such UAVs could possibly react more quickly and without bias, but would lack human sensibility. Heather Roff[clarification needed] replies that Lethal autonomous robots (LARs) may not be appropriate for complex conflicts and targeted populations would likely react angrily against them. Will McCants argues that the public would be more outraged by machine failures than human error, making LARs politically implausible. According to Mark Gubrud, claims that drones can be hacked are overblown and misleading and moreover, drones are more likely to be hacked if they're autonomous, because otherwise the human operator would take control: "Giving weapon systems autonomous capabilities is a good way to lose control of them, either due to a programming error, unanticipated circumstances, malfunction, or hack and then not be able to regain control short of blowing them up, hopefully before they've blown up too many other things and people." Others have argued that the technological possibility of autonomy should not obscure the continuing moral responsibilities humans have at every stage. There is an ongoing debate as to whether the attribution of moral responsibility can be apportioned appropriately under existing international humanitarian law, which is based on four principles: military necessity, distinction between military and civilian objects, prohibition of unnecessary suffering, and proportionality. In 2009, the Brookings Institution reported that in the US-led drone attacks in Pakistan, ten civilians died for every militant killed. A former ambassador of Pakistan said that American UAV attacks were turning Pakistani opinion against the United States. The website PakistanBodyCount.Org reported 1,065 civilian deaths between 2004 and 2010. According to a 2010 analysis by the New America Foundation 114 UAV-based missile strikes in northwest Pakistan from 2004 killed between 830 and 1,210 individuals, around 550 to 850 of whom were militants. In October 2013, the Pakistani government revealed that since 2008 317 drone strikes had killed 2,160 Islamic militants and 67 civilians – far less than previous government and independent organization calculations. Controllers can also experience psychological stress from the combat they are involved in. A few may even experience posttraumatic stress disorder (PTSD). There are some reports of drone pilots struggling with post traumatic stress disorder after they have killed civilians, especially children. Unlike bomber pilots, moreover, drone operators linger long after the explosives strike and see its effects on human bodies in stark detail. The intense training that US drone operators undergo "works to dehumanise the ‘enemy’ people below whilst glorifying and celebrating the killing process." There are new case studies that are examining the psychological effects drones have on the citizens on the ground. Peter Schaapveld, a forensic psychologist, conducted research in Yemen on the psychological effects of drones. He found that "92 percent of the population sample he examined was found to be suffering from post-traumatic stress disorder – with children being the demographic most significantly affected." Psychologists in Gaza, meanwhile, talk of a whole generation of Gazan children suffering deep psychological trauma because of the continual exposure to the buzzing sounds of drones high above, machines that can spit lethal violence upon them and their families at any moment. Stanford’s ‘Living Under Drones’ researchers, meanwhile, have shown that civilians in Pakistan and Afghanistan are reluctant to help those hit by the first strikes because rescuers themselves have often been killed by follow-on drone strikes. Injured relatives in the rubble of the first strike have been known to tell their relatives not to help rescue them because of the frequency of these so-called ‘double-tap’ strikes. People also avoid gathering in groups in visible places. Many children are permanently kept indoors and often no longer attend school. In March 2013, DARPA began efforts to develop a fleet of small naval vessels capable of launching and retrieving combat drones without the need for large and expensive aircraft carriers. In the UK, the UXV Combatant which would have been a ship dedicated to UCAVs was proposed for the Royal Navy. In November 2014, the Pentagon made an open request for ideas on how to build an airborne aircraft carrier that can launch and retrieve drones using existing military aircraft such as the B-1, B-52 or C-130. ^ "Drone warfare: The death of precision". Bulletin of the Atomic Scientists. 2017-05-11. Archived from the original on 2017-10-11. Retrieved 2017-07-22. ^ Kennedy, Caroline; Rogers, James I. (2015-02-17). "Virtuous drones?". The International Journal of Human Rights. 19 (2): 211–227. doi:10.1080/13642987.2014.991217. ISSN 1364-2987. ^ "The Simulation of the Human-Machine Partnership in UCAV Operation" (PDF). College of Aeronautics, Northwestern Polytechnical University, Xi'an 710072, China. Archived (PDF) from the original on 2017-08-05. Retrieved 7 February 2013. ^ Dowd, Alan. "Drone wars: risks and warnings". Retrieved 4 March 2014. ^ Martin Streetly, ed. (2014). Jane's All the World's Aircraft: Unmanned 2014-2015. London: IHS Jane's. ISBN 978-0710630964. ^ "Arminfo: Azerbaijan uses Israel-made Harop drone against NKR". arminfo.am. Retrieved 6 April 2016. ^ "China's Weapons of Mass Consumption". Archived from the original on 2016-10-10. Retrieved 2016-10-04. 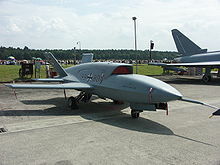 ^ "PICTURE: Germany's first Heron UAV emerges". Flightglobal.com. 2010-02-19. Archived from the original on 2013-09-27. Retrieved 2013-09-22. ^ "Defence Industry Daily: Israel sells heron UAVs to India and Australia". Strategypage.com. 2005-11-11. Archived from the original on 2013-09-29. Retrieved 2013-09-22. ^ "Like It or Not, Iran Is a Drone Power". War is Boring. 5 September 2015. ^ "Italian Air Force Orders P.1HH HammerHead UAS - Inside Unmanned Systems". Inside Unmanned Systems. 5 March 2015. Archived from the original on 2017-12-22. Retrieved 21 December 2017. ^ Fischer Junior, Richard. "Kazakhstan purchases two Chinese Wing-Loong UCAVs". IHS Jane's 360. Archived from the original (7 June 2016) on 8 June 2016. Retrieved 7 November 2016. ^ Lin, Joseph (20 March 2015). "China's Weapons of Mass Consumption". Foreign Policy. Archived from the original on 2016-11-11. Retrieved 7 November 2016. Since 2011, China has also sold the Wing Loong, an armed drone, to several countries in Africa and the Middle East, including Nigeria, Egypt, and the United Arab Emirates. ^ Yüzde 100 Yerli (30 April 2016). "Milli İHA Bayraktar'dan gerçek mühimmat ile tam isabet (full video)" – via YouTube. ^ "UAV Infrastructure Noted at the UAE's al-Safran Airbase". Belling Cat. 2 October 2018. ^ Rogers, Simon (3 August 2012). "Drones by country: who has all the UAVs?". The Guardian. Archived from the original on 2015-09-12. Retrieved 18 August 2015. ^ a b c Fred Kaplan (June 7, 2013). "The World as Free-Fire Zone". MIT Technology Review. Retrieved June 17, 2013. ^ "A Brief History of UAVs". Archived from the original on 2013-05-22. Retrieved 2013-08-14. ^ "Russia Buys A Bunch Of Israeli UAVs". Archived from the original on 2013-10-26. Retrieved 2013-08-14. ^ Azoulai, Yuval (October 24, 2011). "Unmanned combat vehicles shaping future warfare". Globes. Archived from the original on 2013-12-03. Retrieved 2013-08-14. ^ Levinson, Charles (January 13, 2010). "Israeli Robots Remake Battlefield". The Wall Street Journal. p. A10. Archived from the original on 2015-05-03. Retrieved January 13, 2010. ^ Michel, Arthur Holland (17 December 2015). "How Rogue Techies Armed the Predator, Almost Stopped 9/11, and Accidentally Invented Remote War". Wired. Archived from the original on 2015-12-18. Retrieved 17 December 2015. ^ "The Toll Of 5 Years Of Drone Strikes". The Huffington Post. 24 January 2014. Archived from the original on 2014-10-07. Retrieved 5 October 2014. ^ a b Ed Pilkington (June 17, 2015). "Former US military personnel urge drone pilots to walk away from controls". Archived from the original on 2015-06-18. Retrieved June 18, 2015. ^ a b "India joins select group to develop UCAV technology". The Hindu. 27 August 2007. Archived from the original on 2012-11-03. Retrieved 2012-09-24. ^ "Fixed Wing UAV: Buraq | Tunisia Aero Technologies Industries S.A". Tati-uas.com. Archived from the original on 2013-09-27. Retrieved 2013-09-22. ^ "UMEX 2016: Vestel's Karayel goes operational – IHS Jane's 360". Archived from the original on 2016-09-14. Retrieved 2016-08-30. ^ "Pakistan successfully tests first combat drone". ^ "Iran's Shahed-129 Combat Drone to Enter Serial Production". defense-update.com. Archived from the original on 2013-10-02. Retrieved 2013-10-02. ^ "N. Korea developing unmanned attack aircraft from U.S. drones: source". Yonhap. 2012-02-05. Archived from the original on 2012-03-10. Retrieved 19 June 2012. ^ Editorial Archived 2017-10-20 at the Wayback Machine, The New York Times, January 1, 2011 (January 2, 2011 p. WK7 NY ed.). Retrieved 2011-01-02. ^ "Gates Reveals Budget Efficiencies, Reinvestment Possibilities". Defense.gov. Archived from the original on 2013-08-20. Retrieved 2013-09-22. ^ a b c Foust, Joshua (8 October 2013). "Why America Wants Drones That Can Kill Without Humans". Defense One. Archived from the original on 2014-07-19. Retrieved 15 July 2014. ^ Gubrud, Mark Avrum (11 October 2013). "New Faustian pro-Terminator meme infection spreading". Mark Gubrud's Weblog. Archived from the original on 2014-07-22. Retrieved 15 July 2014. ^ Robillard, Michael (29 January 2018). "The 'Killer Robots' are Us". The New York Times. Archived from the original on 2018-02-12. Retrieved 11 February 2018. ^ Kanwar, Vik (2011). "Post-Human Humanitarian Law: The Law of War in the Age of Robotic Weapons" (PDF). Harvard National Security Journal. Archived (PDF) from the original on 2017-01-20. Retrieved 11 February 2018. ^ The Guardian, 23 March 2009. "Cut to pieces: the Palestinian family drinking tea in their courtyard: Israeli unmanned aerial vehicles – the dreaded drones – caused at least 48 deaths in Gaza during the 23-day offensive." Archived 2017-01-10 at the Wayback Machine Retrieved on 3 August 2009. ^ "Precisely Wrong – Human Rights Watch". Hrw.org. Archived from the original on 2015-01-28. Retrieved 8 January 2015. ^ "Report: IDF used RPV fire to target civilians". Ynet.co.il. Retrieved 8 January 2015. ^ "Israel/Gaza: Civilians must not be targets: Disregard for Civilians Underlies Current Escalation". Human Rights Watch. 30 December 2008. Archived from the original on 2009-07-27. Retrieved 3 August 2009. ^ John O. Brennan (30 April 2012). "The Ethics and Efficacy of the President's Counterterrorism Strategy". Woodrow Wilson International Center for Scholars. Archived from the original on 2012-10-31. Retrieved 1 May 2012. ^ Owens, Hudson L.; Flannes, M. (2011). "Drone Warfare: Blowback from the New American Way of War". Middle East Policy. 18 (3): 122–132. doi:10.1111/j.1475-4967.2011.00502.x. ^ Alex Rodriguez; David Zucchino; David S. Cloud (May 2, 2010). "U.S. drone attacks in Pakistan get mixed response". Los Angeles Times. p. 2. Archived from the original on 2012-04-19. ^ Daniel L. Byman (14 July 2009). "Do Targeted Killings Work?". The Brookings Institution. Archived from the original on 21 May 2016. Retrieved 8 January 2015. ^ Newsweek, 8 July 2009. Anita Kirpalani, "Drone On. Q&A: A former Pakistani diplomat says America's most useful weapon is hurting the cause in his country" Archived 2009-08-14 at the Wayback Machine Retrieved on 3 August 2009. ^ "Home". PakistanBodyCount.org. Retrieved 31 March 2012. ^ Peter Bergen & Katherine Tiedemann. "2004–2011". New America Foundation. Archived from the original on 30 August 2011. Retrieved 10 September 2011. ^ Sebastian Abbot and Munir Ahmed, Associated Press (31 October 2013). "Pakistan says 3% of drone deaths civilians". Usatoday.com. Archived from the original on 2015-09-15. Retrieved 8 January 2015. ^ "A Wedding That Became A Funeral: US Drone Attack on Marriage Procession in Yemen". Human Rights Watch. 19 February 2014. Archived from the original on 2014-08-08. Retrieved 20 July 2014. ^ Smith, Jordan Michael (5 September 2012). "Drone "blowback" is real A new analysis finds five ways drone strikes in Yemen are hurting American interests". Salon.com. Archived from the original on 2012-09-08. Retrieved 8 September 2012. ^ David Zucchino (March 18, 2012). "Stress of combat reaches drone crews". Los Angeles Times. Archived from the original on 2016-03-05. Retrieved 2012-05-24. ^ Rachel Martin (Dec 19, 2011). "Report: High Levels Of 'Burnout' In U.S. Drone Pilots". NPR. Archived from the original on 2018-04-03. Retrieved 2018-04-03. ^ a b "Drone: Robot Imperium – Longreads". longreads.tni.org. Archived from the original on 2017-12-24. Retrieved 2016-11-03. ^ Blake, John (March 9, 2013). "Two enemies discover a 'higher call' in battle". CNN. Archived from the original on 2013-03-12. Retrieved 2013-03-09. ^ "UN News Centre, "UN rights expert voices concern over use of unmanned drones by United States", 28 October 2009". Un.org. 2009-10-28. Archived from the original on 2013-06-09. Retrieved 2013-09-22. ^ Mark Bowden. "The Killing Machines – Mark Bowden". The Atlantic. Archived from the original on 2013-09-28. Retrieved 2013-09-22. ^ "Confessions of a Drone Warrior". GQ. Archived from the original on 2014-10-06. Retrieved 5 October 2014. ^ Chatterjee, Pratap (March 2015). Is Drone Warfare Fraying at the Edges? Archived 2015-07-18 at the Wayback Machine. "Are Pilots Deserting Washington's Remote-Control War? A New Form of War May Be Producing a New Form of Mental Disturbance." ^ 8/21/13 5:44pm 8/21/13 5:44pm. "Nobody Wants to Fly Air Force Drones Because It's a Dead End Job". Gizmodo.com. Archived from the original on 2013-09-24. Retrieved 2013-09-22. ^ Carroll, Rory (2 August 2012). "The philosopher making the moral case for US drones". The Guardian. ISSN 0261-3077. Archived from the original on 2017-02-18. Retrieved 4 February 2016. ^ "Drone Program Poll: The Public Does Not Uncritically Embrace Targeted Killings". The Huffington Post. 15 February 2013. Archived from the original on 2014-10-07. Retrieved 5 October 2014. ^ "Public Continues to Back U.S. Drone Attacks". Pew Research Center. 28 May 2015. Archived from the original on 2016-04-10. Retrieved 12 April 2016. ^ "U.S. Use of Drones, Under New Scrutiny, Has Been Widely Opposed Abroad". Pew Research Center. 6 February 2013. Archived from the original on 2014-10-06. Retrieved 5 October 2014. ^ "Global Opposition to U.S. Surveillance and Drones, but Limited Harm to America's Image". Pew Research Center. 14 July 2014. Archived from the original on 2016-04-22. Retrieved 12 April 2016. ^ "Darpa looks to use small ships as drone bases". BBC. 4 March 2013. Archived from the original on 2013-03-04. Retrieved 4 March 2013. ^ "Warships of Tomorrow". www.popsci.com. Popular Science. 15 February 2008. ^ CNN, Brad Lendon. "Pentagon wants ideas for flying aircraft carrier". Archived from the original on 2016-10-05. Retrieved 2016-10-04.